The Supreme Court on Wednesday made it mandatory for all cinema theatres to play the national anthem before a movie begins during which the national flag is to be shown on the screen. A bench of Justice Dipak Misra and Justice Amitava Roy also said that everyone present in cinema hall should rise up and pay respect to the anthem when it is played. The Supreme Court in Anjan Dasgupta vs. The State of West Bengal, held that the receipt and recording of First Information Report is not a condition precedent for setting in motion a criminal investigation and the police are duty bound to start investigation when it gets information with regard to commission of crime. Dislodging concurrent finding of the guilt of in-laws accused of abetting a woman’s suicide, the Supreme Court in Gurcharan Singh vs. State of Punjab, observed that intention and involvement of the accused to aid or instigate the commission of suicide is imperative to constitute abetment. The comprising Justice Dipak Misra and Justice Amitava Roy observed that remoteness of the culpable acts or omissions rooted in the intention of the accused to actualise the suicide would fall short as well of the offence of abetment essential to attract the punitive mandate of Section 306 IPC. The Supreme Court in Mukarrab vs. State of UP, reiterated that ossification test cannot be regarded as conclusive for ascertaining the age of a person. This observation was made by a bench comprising Justice AK Sikri and Justice R Banumathi, while dismissing the claim of juvenility by two persons convicted by the high court. Supreme Court of India on Friday rejected an application filed by BJP leader, Advocate Ashwini Kumar Upadhyay to make the National Anthem compulsory for all the Courts throughout the Country on technical grounds. A division bench of the Supreme Court raised doubt over the correctness of judgment in ITI Ltd. vs. Siemens Public Communications Network Ltd., wherein it was held that that the applicability of Civil Procedure Code is not prohibited in an arbitration appeal proceedings under Section 37 of the Arbitration and Conciliation Act, 1996. The matter has now been referred to a larger bench for reconsideration. 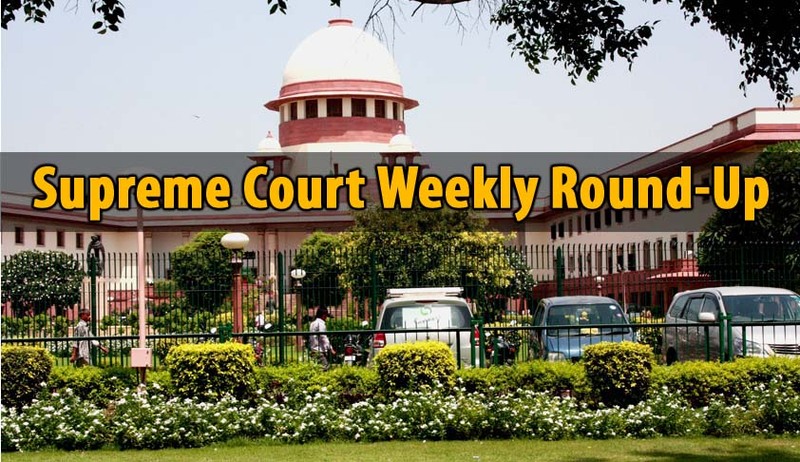 A bench of Chief Justice T S Thakur and justice D Y Chandrachud questioned the inordinate delay in filling up vacant positions in the NHRC including that of the Director General of Investigation and a Member. The bench specifically asked the reasons for the delay and expressed dissatisfaction over the status report filed by the government. The Supreme Court on Tuesday asked the Centre to take a decision regarding making the ancient practice of yoga mandatory in schools for students aged between six and fourteen. A bench of Justice Madan B Lokur and Justice Adarsh Kumar Goel was acting on separate petitions filed by lawyers J C Seth and Ashwini Kumar Upadhyaya seeking imparting yoga training in schools. The Supreme Court on Thursday sought a report on the present status of land and other properties on the Sutlej-Yamuna Link canal site caught in a dispute between Punjab and Haryana and again appointed receivers. The Supreme Court bench comprising Justices Madan B Lokur and N.V.Ramana on Thursday made it clear that State Food Commissions should be constituted at the earliest in accordance with Section 16 of the Food Security Act. The bench disapproved of the practice of some States having some other body function as the State Food Commission without having the necessary expertise or the qualification to function as a State Food Commission. Sahara Group chiefSubrata Roy was asked by the Supreme Court on Monday to deposit Rs 600 crore more by February 6 next year in the SEBI-Sahara refund account to remain out of jail A special bench headed by Chief Justice T S Thakur significantly cautioned him that in case of failure, he would have to return to prison. Foreign funding: BJP/Congress withdraw SLPs.